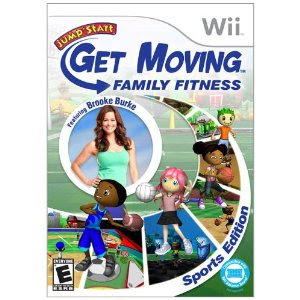 I was sent a copy of the Wii game Jumpstart Get Moving: Family Fitness by the people at Jumpstart so I could try it out and review it. I'm always happy to try out things that I think Zoe will enjoy... and the Jumpstart products and games are usually right up her alley. The description I received about the game told me that JumpStart has been creating the best learning games for kids, and now they are making fitness fun too! "Discover the ultimate family sports game with fitness expert and mom of 4, Brooke Burke. With more than 15 sports challenges in 11 exotic arenas, Get Moving is the fun, new way to keep your family active! Some key features in our new Wii game make it all the more exciting! You can design your own character to race and play, build customized routines for extra challenge, compete head to head or play solo, play underwater, on a farm, in Egypt of 8 other exotic locations, and access expert tips for more ways to stay healthy!" As usual... Zoe loved creating her character. Being able to give her girl pink hair? Major plus in her book. Being able to pick your location for each game was also fun. I mean... who wouldn't want to play volleyball with the background of a princess castle or while being the size of a bug? Jumpstart Get Moving just added a lot of fun to the regular sports fitness games. -The ability to design and dress up your character is always a plus in our house. -The background were creative and fun... and even better since you could pick your own! -Being able to actual watch a real person demonstrate how to play before each activity was VERY helpful. -Brooke Burke? Really? If you were going to have a "star" I would think there might be someone more familiar to kids you could use. -We found a few of the challenges to be a little short or quick to finish. -Sometimes Zoe spent more time deciding "where" to play than she actually spent playing. I didn't think it was necessary to pick a new location for every activity you played. Jumpstart was kind enough to offer a copy of Jumpstart Get Moving: Family Fitness to me to give away to a reader. It really is a great game for kids (and families)... so I'm excited to be able to share this with someone. In order to enter you just need to comment on this post. In your comment tell me something you enjoy doing with your kids (or without kids!!!) that helps you all "get moving"! If you would like an extra entry you can send out a tweet linking to this post... and leave a 2nd comment letting me know you did it. Giveaway will be open until midnight on Wednesday August 25th, 2010.